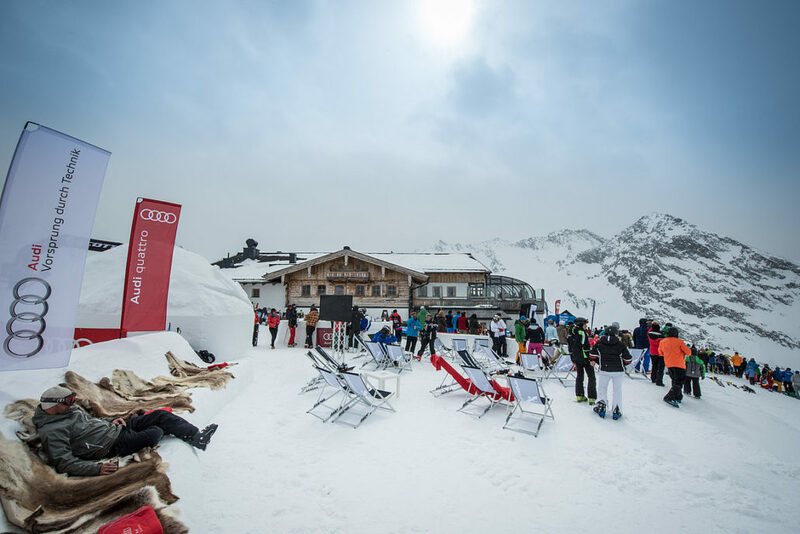 The teams from Australia and Austria started their journey to Axamer Lizum for an extraordinary photo shooting in the snow. Some of the Australians never saw snow before. Follow the team Australia and their mountain adventure and find out how it feels to chop an ice block with an axe. 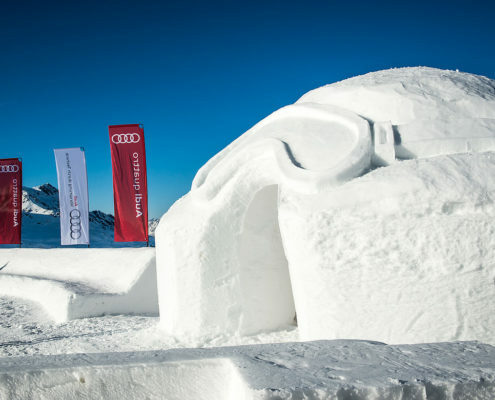 7.5 m long, 3 m high, 2.5 m wide, 23 tons, 140 working hours and finished was the newest Q7 made of snow. 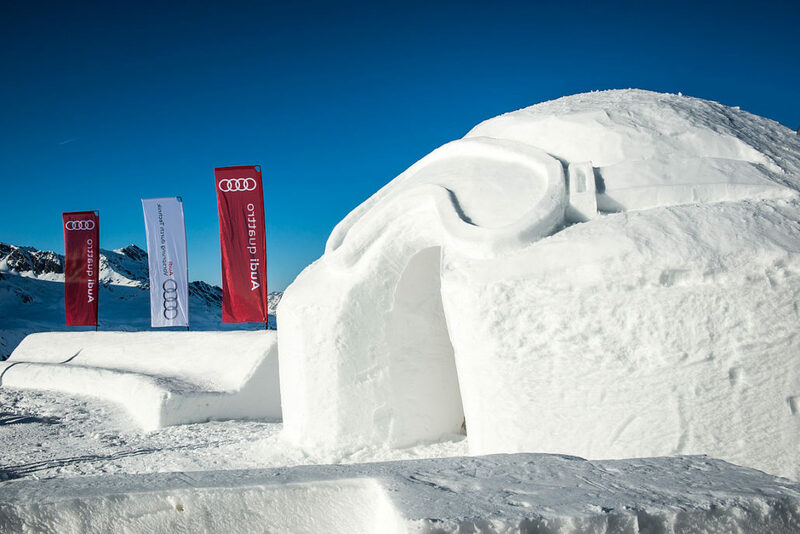 Under extreme conditions the ALPENIGLU® team built the newest AUDI Q7 Quattro model 1.5 times bigger than the original. 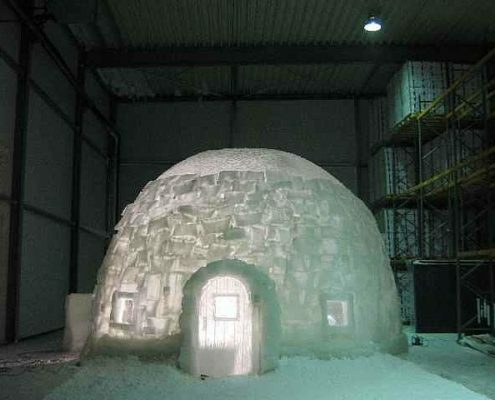 “Is is so cool, nearly magical, what you can create of snow and ice” is the tenor of all the onlookers. 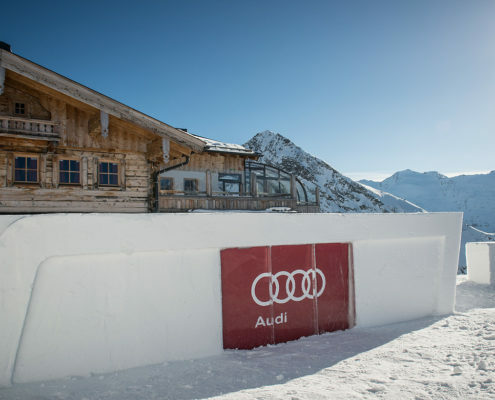 And of course the car was the favourite photo motif of all skiers. 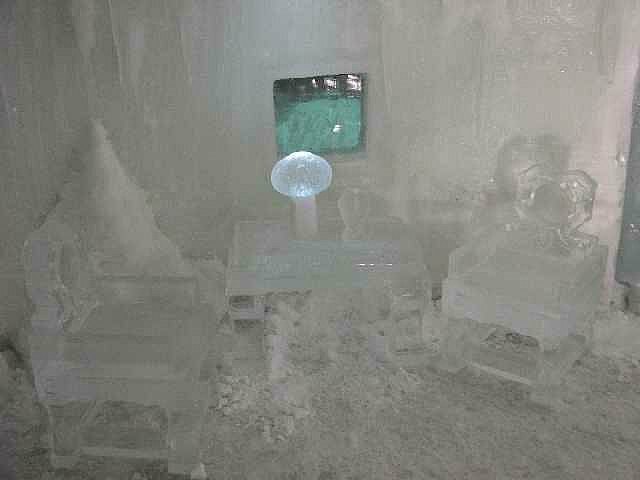 of 1 : 1, using only clear ice blocks. 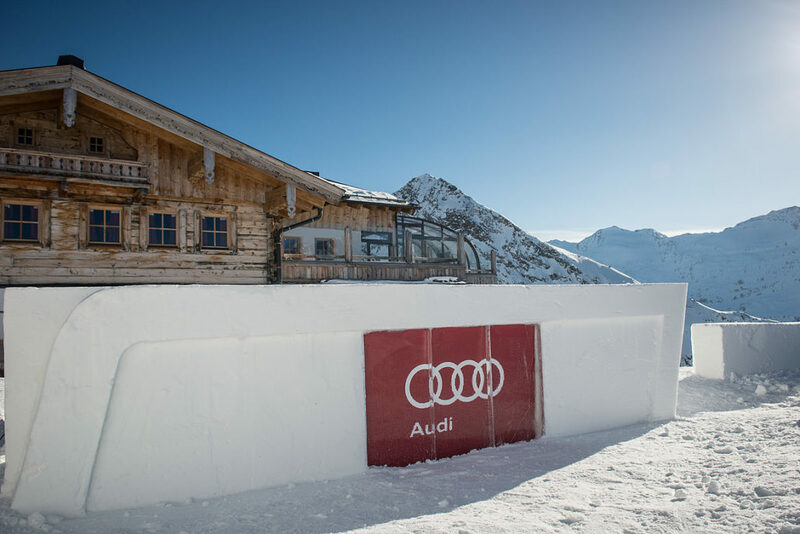 From the conceptual design to logistics and up to the professional implementation, the ALPENIGLU® Eis pros delivered the car “ready for use” at its final destination at 1,700 metres up in the mountains. AUDI was happy. 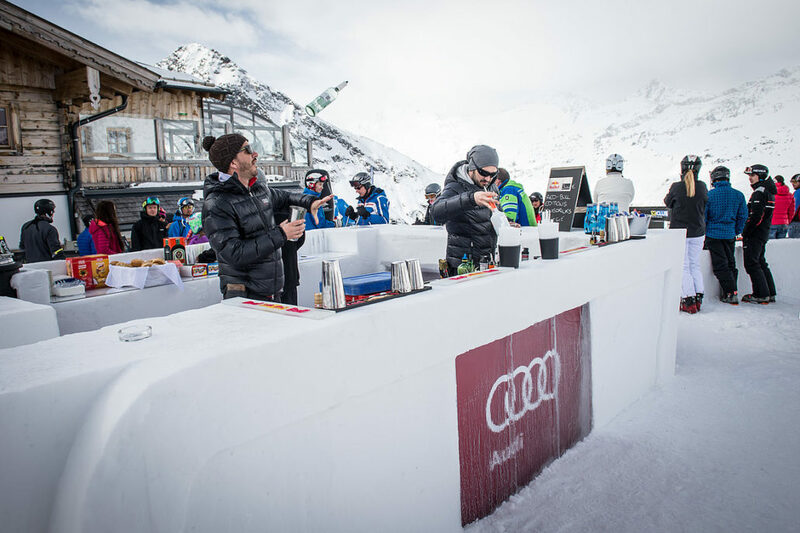 ALPENIGLU® Eis delivered ice blocks with flasks and mobile phone cases for “Tirol Werbung”. 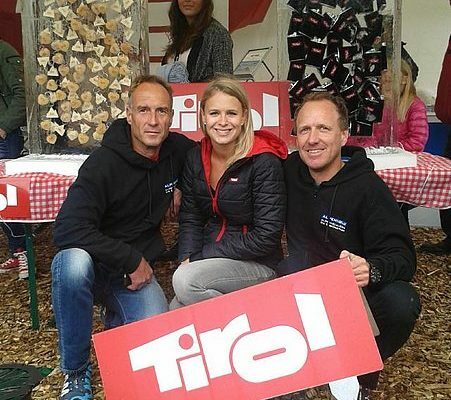 They attracted a lot of attention at the Danish Ski Event Day in Aarhus / Danmark. 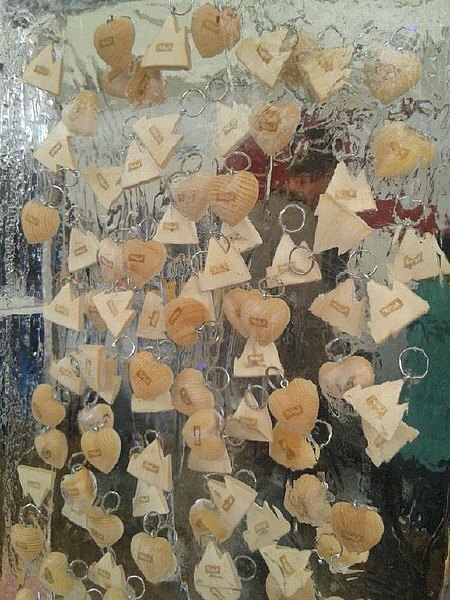 The ice blocks drew the people in as they could pick the free give-aways out of the ice themselves. 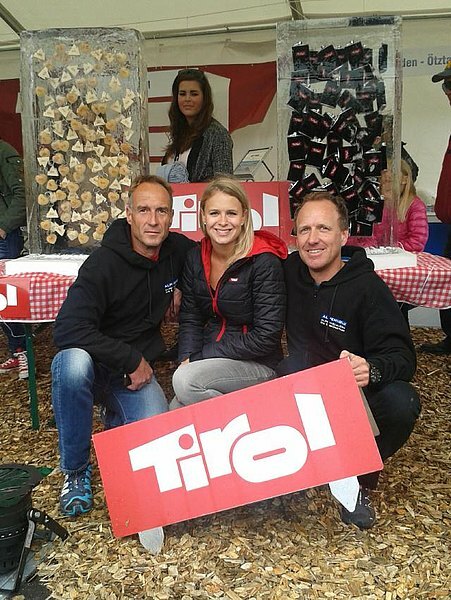 Even princess Marie of Danmark could not resist. 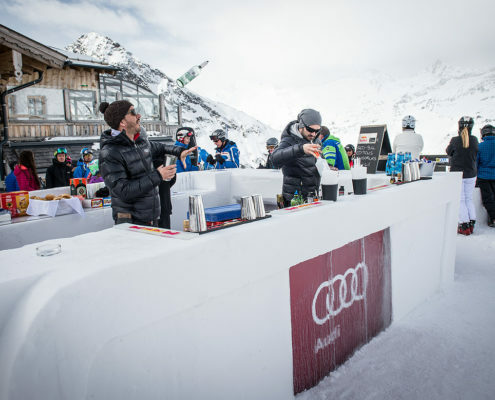 The guys of ALPENIGLU® Eis built a cool snow bar in Oberstdorf as well as a complete mountain lodge in Obergurgl, exclusively for AUDI. 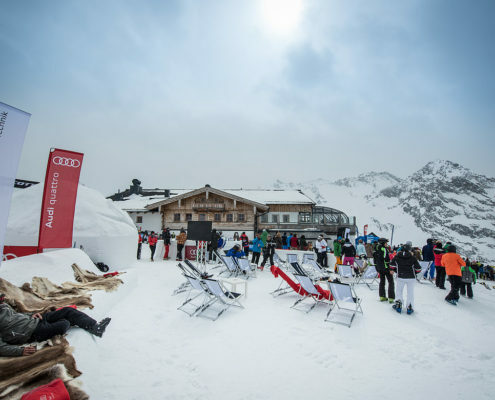 Whether it was at the stylish snow bar or in the cosy mountain lodge, the guests were amazed, took time to relax and a lof of photos. 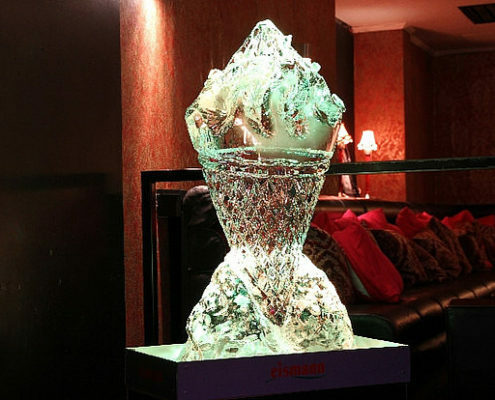 ALPENIGLU® ice art in the P1 in Munich. 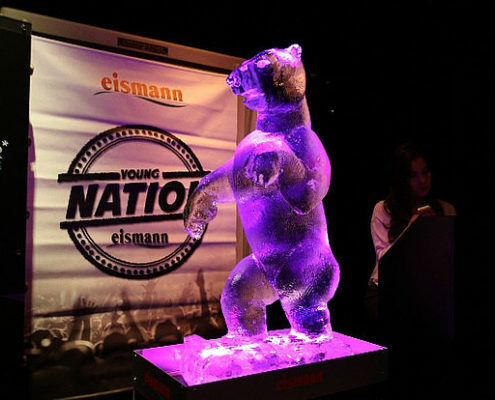 The company Eismann invited to a cool evening in the posh club in Munich. 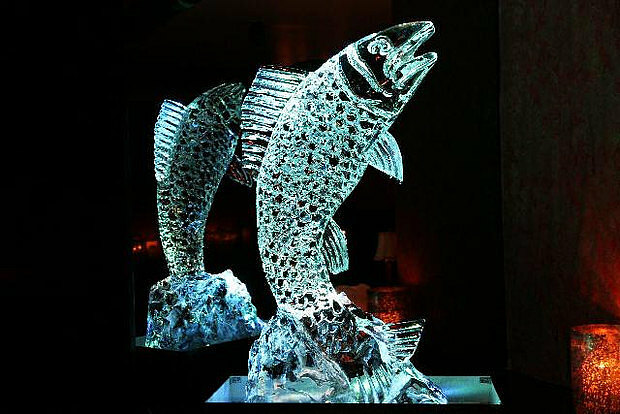 The ALPENIGLU® ice art team with the live ice carving act was one of the highlights of the evening. 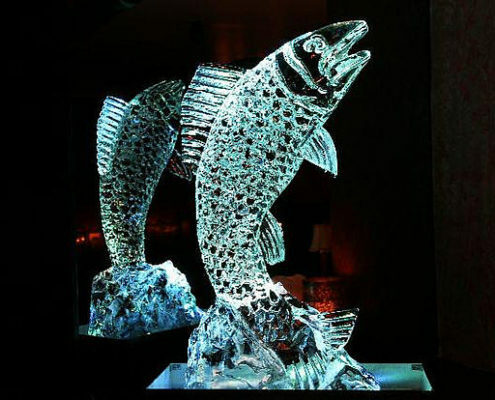 Later, the ice sculptures were presented and illuminated with LED lighting. 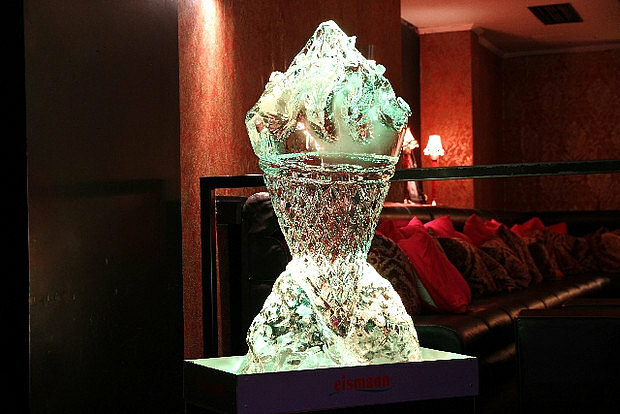 It was an amazing interior decoration and the guests were thrilled. 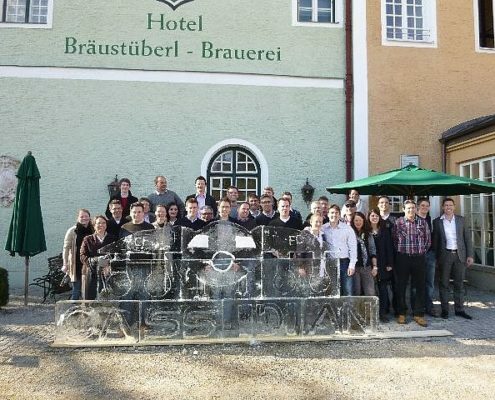 A company workshop near Munich. 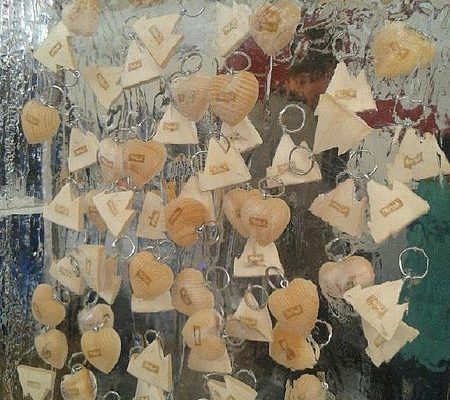 An additional group task was requested, that relates to the topic of the workshop, can be conducted at the event location and is something unusual. The ALPENIGLU® proposal: ice carving as a group task. 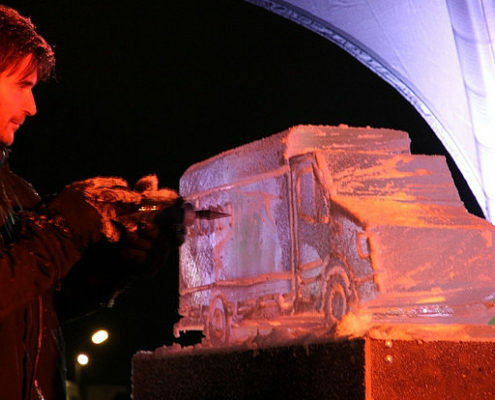 Together as a team they built a giant ice plane. 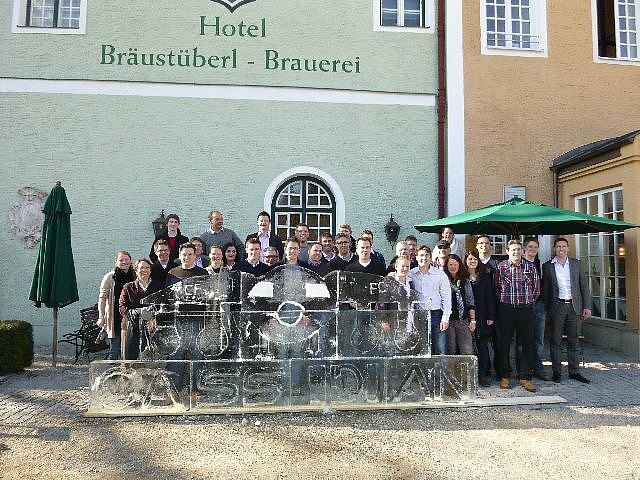 The difficulty for the 40 participants was the coordination in between the 10 different teams. 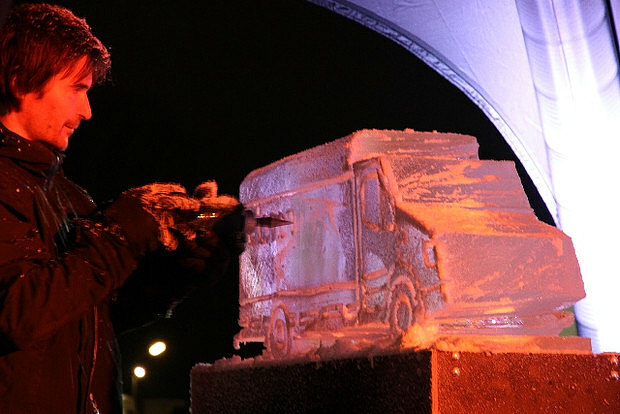 In the end 10 massive ice blocks had to put together to one final sculpture. After 2 hours the group successfully finished the task and continued with the workshop. 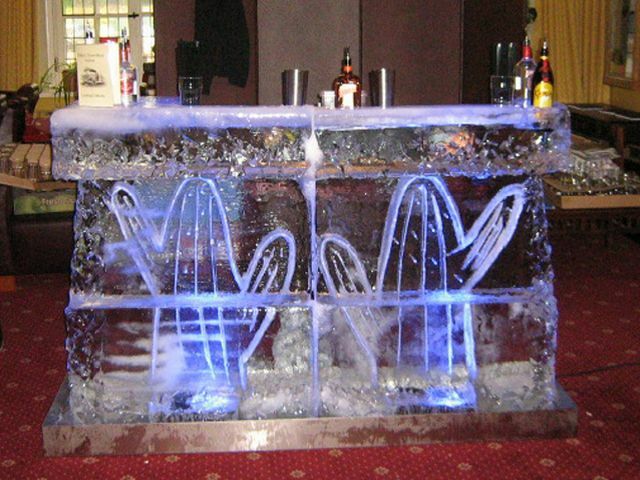 For the summer ball of the British Army officer corps in Gütersloh ALPENIGLU® Eis delivered ice art related to the theme “Country & Western”: an ice counter “cactus” and vodka slides in the shape of a cowboy and Native American. 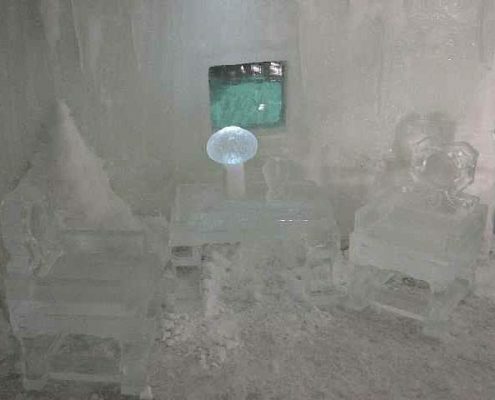 A cold store in Berlin, in the front are deep-frozen peas and beans at a temperature of -19°C, in the back is a whole igloo with tables, chairs, a bed, cushions, lamps, an oven, windows, a door and a buddha… everything made of ice. Greetings from Hollywood! 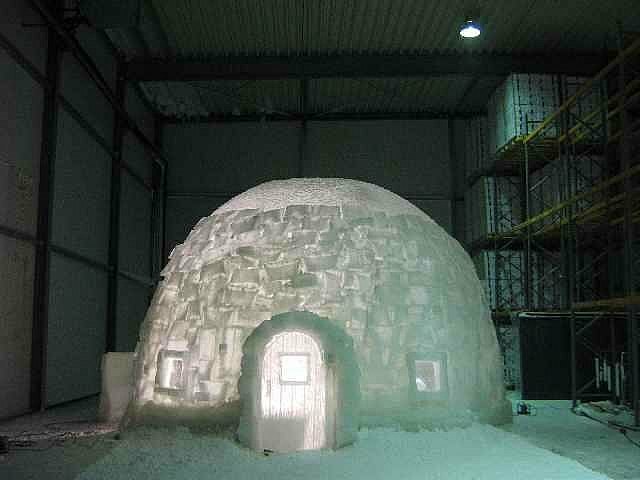 The ALPENIGLU® team was assigned with the task to build the home of the little yeti “YOKO”. 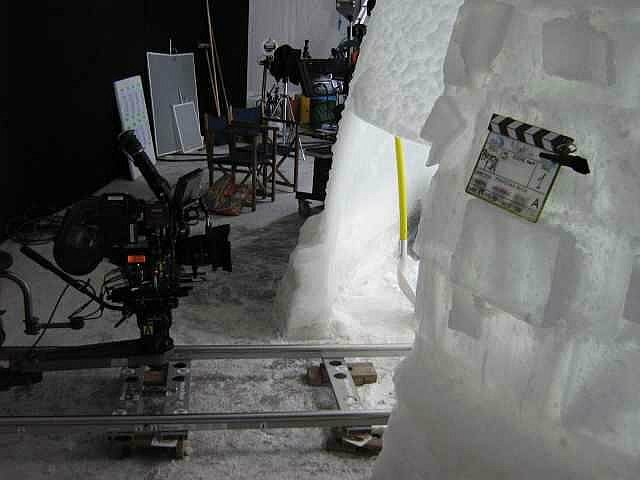 This real world of ice, snow, stalactites and stalagmites was finished in only 6 days in the cold store at icy temperatures. Everything could be filmed within one day, as it was not necessary to change anything. The day of shooting itself there was an international film team of 60 people. 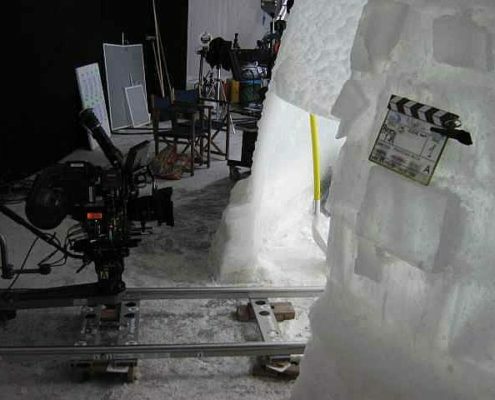 In addition to that they were happy to get help from our ALPENIGLU® Crew, to finish two scenes. This was an exciting and at the same time funny experience for the team. They can be proud of their work. One day the little yeti Yoko appears in the tree house of eleven-year-old Pia (Jamie Bick). They become friends and together they fight against the mean big game hunter Thor Van Sneider (Tobias Moretti), who is chasing Yoko. A risky adventure starts for Pia. Her mother (Jessica Schwarz) does not know anything about her daughter’s hairy secret yet. 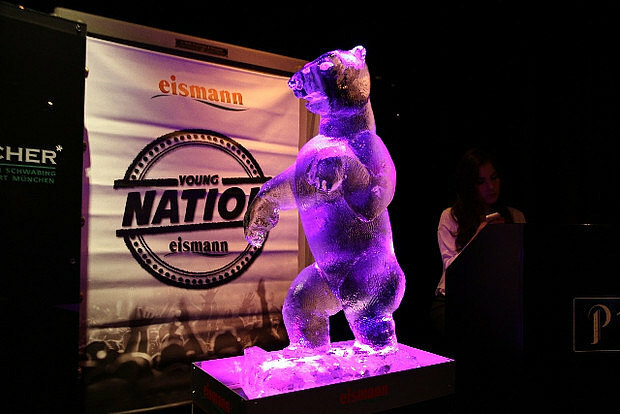 Actors: Jessica Schwarz, Tobias Moretti, Justus von Dohnányi, Jamie Bick, Lilly Reulein, Friedrich Heine. 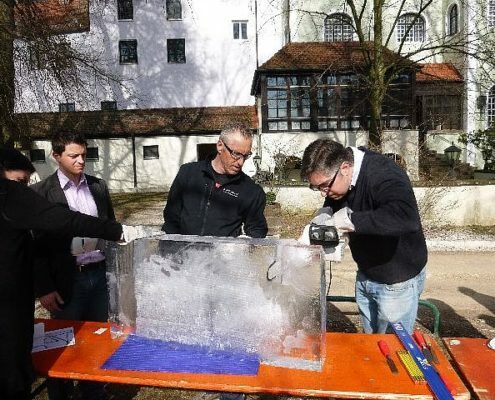 The ALPENIGLU® team used 18 tons of crystal clear ice to build 3 huge ice columns (2 m high) for the cooling specialist LIEBHERR. Every column was illuminated with blue LED light. 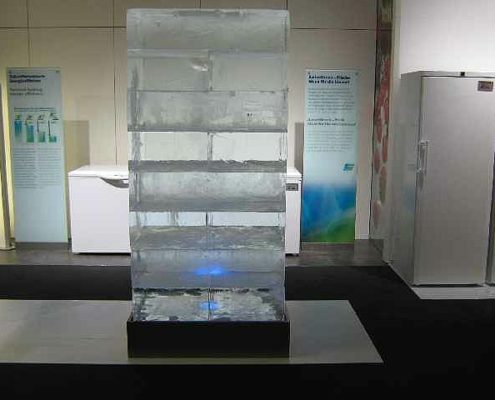 An ingenious drainage system was installed directly in the floor to collect the meltwater. 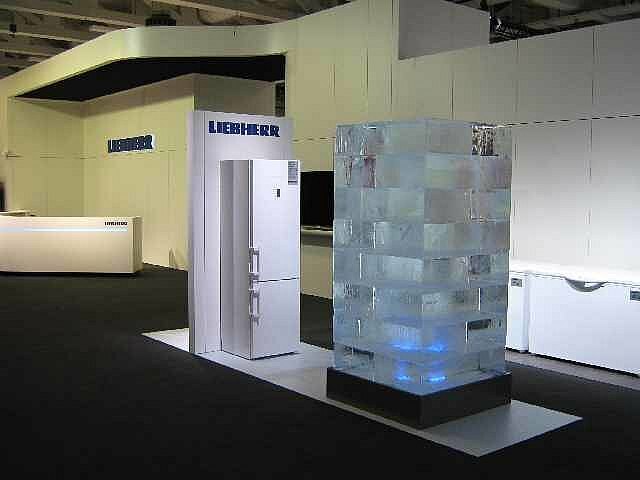 The LIEBHERR team was thrilled as the 3 big ice columns fit perfectly in the exhibition concept and matched the presented cooling devices. 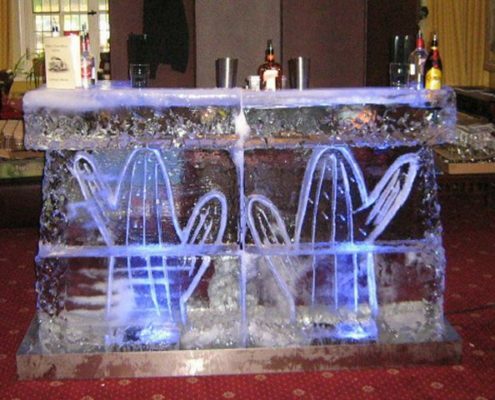 The ice columns were a downright crowd-puller. 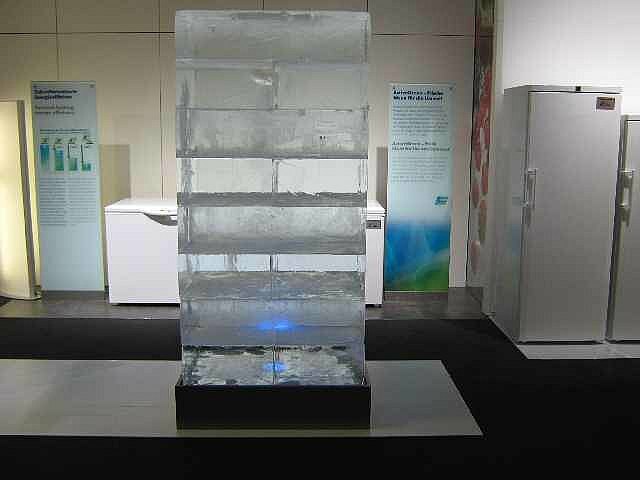 Every visitor, who passed by the ice columns, touched them instinctively, to verify the authenticity of the ice. 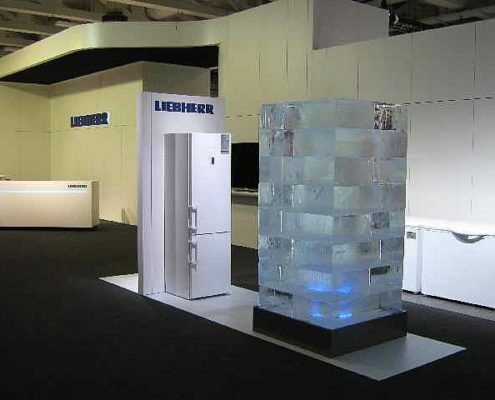 Experience coldness, the perfect message for a cooling specialist!